eCommerce has been growing steadily since the turn of the millennium, and this rate is expected to increase dramatically in the years to come. According to Absolunet, almost 60% of retail sales are influenced by digital experience in some form. Mobile sales grew more than 55% last year, and eCommerce now accounts for nearly a fifth of all retail revenue worldwide. In order to stay competitive in the current market, it’s essential to keep up to date with the current eCommerce trends. Online sales is a dynamic field, with advancements in programming, available technology, and consumer behavior changing the face of eCommerce every year. It’s also become one of the key factors for keeping your business alive and strong. Even brick and mortar stores are discovering that their online presence is central to brand building and increasing sales. In-person and digital experiences are becoming more closely linked, and customers expect seamless integration between physical stores and their online counterparts. Some trends have fallen out of favor in the current market. Among these are returns. Before now, offering free returns has been a huge incentive for online sales. However, according to Shopify, within the last year, returns alone accounted for nearly $500 billion dollars. Companies can no longer offer free returns without facing significant losses. Free tax is another technique eCommerce sites have used to drive sales, but with current changes in tax laws, it’s no longer profitable for businesses to continue this strategy. Apps are also dropping out of favor, replaced by fast, efficient PWA’s that customers can make use of without having to download them. 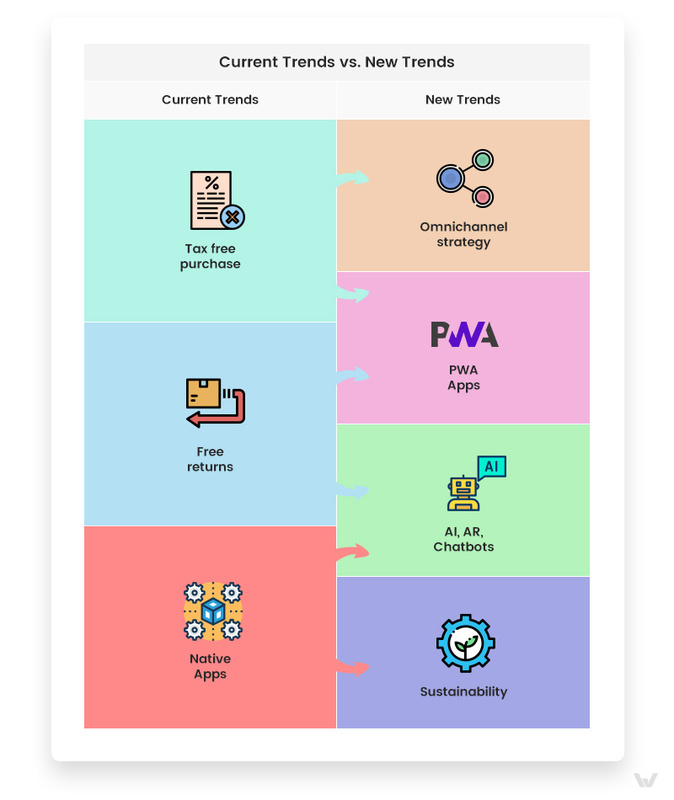 So, now with free returns, free tax, and apps on the way out, what trends are emerging in 2019? Let’s have a look at some of the biggest shifts that will impact eCommerce this year. Developing lasting customer relationships has always been the key to boosting sales and increasing profits, and it’s no different with eCommerce growth. Plus, the digital experience offers a host of unique ways to connect with customers and create a customized, immersive experience. On the website alone, chatbots, personalization, and interactive product technology have risen to the top of current strategies to boost engagement. More and more eCommerce sites each year are making use of video content and augmented and virtual reality. Many brands also offer online courses and tutorials for their products, a strategy which has been popular in the fashion and technology industries to date. In addition to the digital approach, brick and mortar stores are popping up to support eCommerce sites with a physical location. This provides a physical product experience and interactions in-person, making the store more accessible and strengthening the brand. It’s also become popular to provide digital kiosks within the store to integrate online and in-store experiences. One of the biggest challenges traditionally faced by online stores is to personalize the experience. In a physical store, clerks can engage directly with a customer, offering advice and making personalized recommendations to fit their customer’s needs. On average, according to Ziffity, when the experience is personalized, a customer will spend about 48% more per purchase. One of the most important trends in 2019 is to increase personalization to mimic this in-store experience. Online retail sales statistics show that about 57% of customers are happy to provide personal information for the purpose of improving their shopping experience. Some of the best strategies for this include using purchase history, page visits, and search queries to offer personalized recommendations. In addition, recent advancements in personalization technology allow your site to offer ads based on previous views and search queries and targeted marketing copy. Convenience is the name of the game when it comes to eCommerce. You want to do all that you can to make the user experience easy. With the rapid growth of mobile sales, this means working with mobile-first sites. Make sure that your site loads quickly, that it’s easy to navigate and includes important features like geolocation services and a PWA (Progressive Web App) that lets customers make use of all the functionality of your site without having to download an app. Another rising trend is to turn your targeted brand into a marketplace. If you have an established brand, you can broaden your customer base and boost sales by branching out and providing other products, or by featuring third-party retailers through your site. Omnichannel is becoming more important every year, so make sure to make use of social media and mobile marketing with options to convert directly through these channels. Image search and voice search are other great features that increase convenience and improve user experience. Video content has become increasingly more important in customer engagement. If a picture is worth a thousand words, a video is worth a million. Customers are more likely to take the time to watch a three-minute video than to read a half page of content. A video is ideal for showcasing product features and sharing the message of your brand. Plus, they are a great way to introduce related products and deliver influencer content. Video personalizes the content and increases user engagement. Try to make use of it in several ways throughout the site, including the homepage, product page, and anywhere else you’d like to make an impact and hold the customer’s attention. One of the most important new trends in retail industry is voice search. This is a great way to add convenience to the online experience. By 2020, voice search is expected to account for half of all searches. For the retail industry, it will account for around $40 billion in sales in the United States alone. According to Shopify, smart speakers are already being used with Google Home and Amazon Alexa, and 22% of customers with these services use voice search to purchase online. In addition, 50% of customers that use voice search to find a local store will visit that store on the same day. More than a third of these visits result in sales. 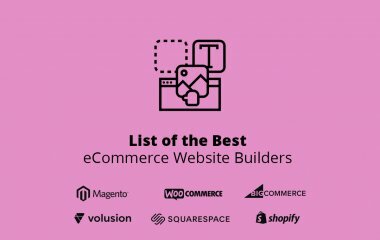 This is a phenomenal conversion rate and one that you will want to make use of in your eCommerce platform in the coming year. Current developments in the field of artificial intelligence have opened up new avenues in the world of retail and eCommerce. AIs can now be used for a wide range of eCommerce solutions. One of the most important applications is in product content. Content is king in the online industry. It is required for each product and category sold on your site. And, as your repertoire grows, your product content has to grow as well. AIs can be used to generate product-specific attributes and detailed product information. They can also link this content with semantic search terms, improving your conversion rates and boosting sales. Whether you need translation, classification, organization, or content creation, AI-based solutions are now becoming accessible to provide these services faster and more efficiently than a live team. Another important use of artificial intelligence is with a chatbot AI. Chatbots are taking the role of online sales clerks, able to engage with the customer and personalize their experience. They can also handle inquiries and manage inventory. Chatbots are also learning algorithms. With each customer experience, customer interaction becomes more refined and more efficient. They literally evolve as they serve your business, providing higher quality user experience the longer they are used. 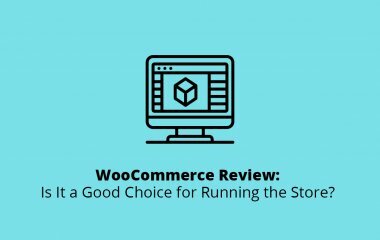 Plus, their versatility allows them to perform several mundane tasks, allowing you to focus on the innovations that will keep your eCommerce site ahead of the competition. 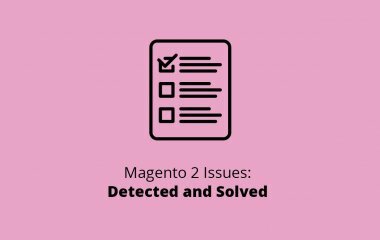 One of the chief problems faced by online stores is the inability to interact physically with products. However, AR, or Augmented Reality, is helping to close this gap by allowing customers to visualize products three-dimensionally and try them out virtually. The homeware and fashion industries have been quick to capitalize on this new technology, using AR to allow customers to virtually try on accessories or clothing or visualize how furniture or other products will look in the home. This is one of the most exciting areas opened up to retailers by new advancements in technology, and it’s still in its infancy. It dramatically boosts customer engagement and helps customers to feel more confident about their purchases. Plus, it creates a richer and more fun shopping experience. Over the next few years, you can expect AR to be utilized by a majority of successful brands. Flexible payment options are one of the most important trends for 2019. It’s important for you to allow customers to pay with more traditional methods, such as credit and debit cards. At the same time, digital wallets have gained far more trust and recognition, and are now a common form of payment as well. PayPal has been around for a while, but other wallets are gaining popularity as well. Some of the top options are Apple Pay, Samsung Pay, and Google Pay. Other couples to keep in mind are ZipPay and AfterPay. These are less well known, but they give customers the option to buy now and pay later without interest rates. The cryptocurrency market is beginning to become a major payment method as well. The benefit of both digital wallets and cryptocurrency is that purchases can be made online without having to enter secure card details. Plus, since these payment methods are expected to exceed card and cash payments within the next ten years, this is a great way to increase mobile conversions and prevent lost sales. Every year, customers are getting savvier about sustainability and environmental impact. They want to know that their purchases are responsible and healthy for the planet and are on the lookout for the ecological costs of internet purchases. This is especially important in packaging. You’ll want to consider making boxes only as large as they need to be, avoiding excess packaging materials, and finding efficient delivery routes. Plus, it’s an added bonus to include messages on the packaging that highlight the company’s efforts at sustainability. These messages should focus on the reuse of materials and waste reduction. It’s also helpful to include messages about social and ecological responsibility on your site. This will align your brand with consumer values and make them more comfortable purchasing from your site. The key to connecting with customers this year and in the years to come is to create a comfortable and balanced user experience. If you place yourself in the position of a new visitor to your site and consider what you would like to feel upon your visit, you’ll see exactly how to customize your site for best effect. 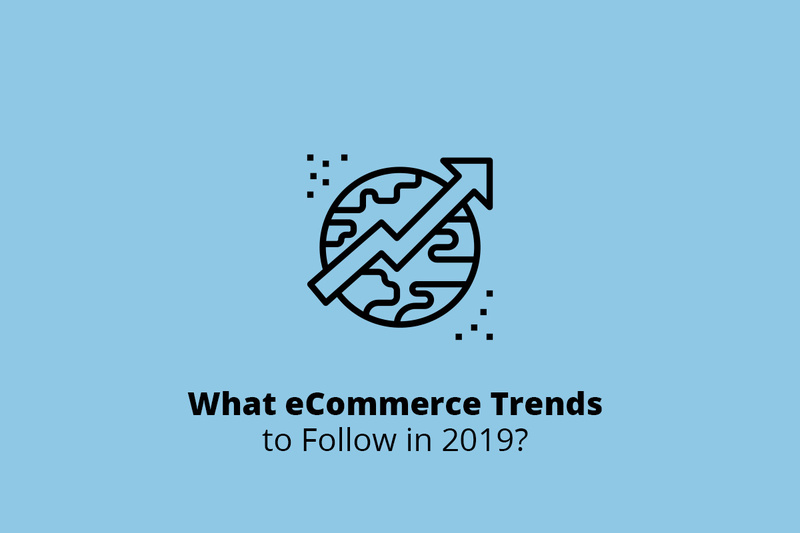 Without a doubt, the new eCommerce trends for 2019 will revolutionize our approach to online sales for many years to come. The core of all of these trends is the seamless user experience. Make it convenient for your customer. Make sure your site is easy to navigate and mobile friendly. Make it easy for users to pay the way that they want to pay. And, perhaps most important for the coming years, consider making use of the new technologies on the market: voice search, chatbots, AI, and AR. If you’d like to look into revolutionizing your site for the current eCommerce trends, feel free to contact us. We are dedicated to making your site as strong as it can be, now and for the life of your brand.